Sachin Tendulkar, the cricket legend, the epitome of inspiration,the messiah of Cricket, the synonym to numerous cricket records has finally decided to put his weapons down. Sachin has finally decided that the 200th Test Match he is about to play in Mumbai ground is going to be his last formal game in International Cricket. Test was the only format where he had enrolled himself after retiring from One Day and all other shorter forms of Cricket.The cricketer declared he decided to retire as his heart says so. 🙁 is the sentiment of all cricket lovers!! Long time Jack. How U doing? 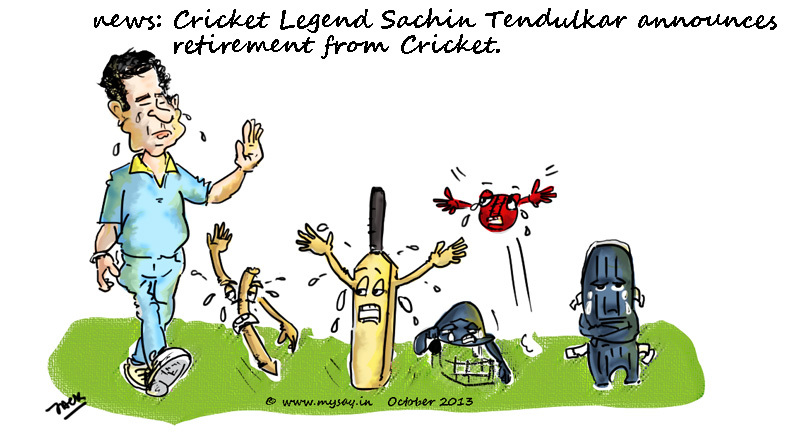 Tendulkar was always my fav cricketer !! He is such a brilliant player ! He should not leave. Love the cartoon ! Ideally he should have gone after the World Cup triumph but he probably found it too hard to leave the game. He still has vestige of greatness in his batting but age is catching up and he is getting out to bowlers he would have slaughtered in his prime. Time to Endulakar it all. He will be missed. Wow ! Very nice doodle 🙂 True that everyone gonna miss him !!! !